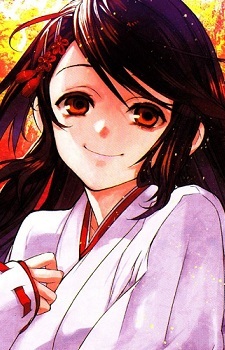 A girl who Shinkurō lived with when he was young and also his sparring partner. Her soft demeanor (albeit with yandere tendencies, triggered by other girls approaching Shinkurō) hides the fact that she is a strong fighter, whom Shinkurō acknowledges to be much stronger than himself, despite her being older by just one year. Yūno is upset that Shinkurō has not realized he was her first love. Even now, she still has feelings for Shinkurō, always finding excuses to spend time with him, such as cooking meals for him. However, her advances tend to be very threatening (most likely because Shinkurō always has another girl with him) and scare him into just letting her hear what she wants. Yūno resents the decision Shinkurō made in deciding to move out her household to live on his own and fears he will change into a hooligan. She has made it very clear that she wants him back in the Hōzuki household. Yūno has a younger sister named Chizuru, who is five, who also has a crush on Shinkurō. Even though the Hōzuki family are no longer assassins, their grandfather expects Yūno and Chizuru to carry on the Hōzuki family martial arts. In the anime, Yūno is much more assertive in her advances towards Shinkurō and does not appear to have the yandere tendencies.